The low angle of incident light on this grey wall surface creates an indeterminable distance to the wall when viewed from the house. 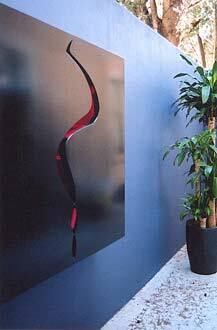 This 'black box' sculpture floats off the wall surface behind. This adds to the mystery of the work. Originally designed to emit light and act as a fountainhead from which water fell to a pond, this abstract piece, 'Dark Continent', retains the sense of light on a river which winds through a landscape at dusk.